Self-regulation is the ability to make decisions and behave in a way that leads to more positive life experiences. Resisting peer pressure, setting future goals, and following through to achieve the goal are examples of self-regulation. Most youth go through adolescence with the expected scrapes and risk-taking behaviour and emerge ready to move on to adulthood. However, some youth get stuck in a pattern of inappropriate behaviour that sets them up for failure. Christine Lackner is pursuing a PhD in Psychology at Brock University. Under the supervision of Dr. Terry Wade, she’s using behavioural genetics and electroencephalography (EEG) to look at how brain cells relay information to each other, resulting in good or poor self-regulating behaviour. EEG technology allows her to track the brain activity of young people on close to a millisecond by millisecond basis. As a result, she can pinpoint when a youth is showing difficulties, enabling her to suggest the most effective clinical intervention – which is not always obvious from a youth’s behaviour profile. 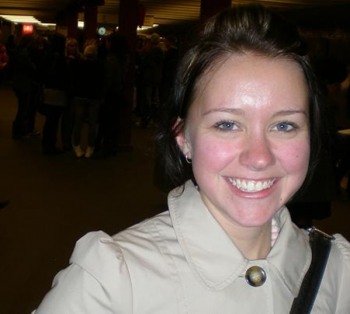 EENet has developed a Student Spotlight on Christine’s work. Student Spotlights are brief profiles of up-and-coming student researchers. Christine Lackner is a graduate student pursuing a PhD in Psychology at Brock University. She completed her undergraduate degree at Brock and then went on to a Master’s at Queen’s University under the direction of Dr. Mark Sabbagh, Department of Psychology. She was intrigued by the work of Dr. Sidney Segalowitz in the Cognitive and Affective Neuroscience Lab and returned to Brock for post-graduate studies. What is Christine’s research about? Self-regulation is the ability to make decisions and behave in a way that leads to more positive life experiences. Resisting peer pressure, setting future goals, and following through on achieving the goal are examples of self-regulation. Most youth go through adolescence with the expected scrapes and risk-taking behaviour and emerge ready to move on to adulthood. However, some youth get stuck in a pattern of inappropriate behaviour that sets them up for failure. Although there is literature on what differentiates poorly functioning clinical samples from typically developing adolescents, there is little information on correlates of individual differences within typically developing samples in which a wide range of behavioural outcomes can also be seen. Christine’s work uses both behavioural genetics and electroencephalography (EEG) to study how brain cells relay information to each other resulting in good or poor self-regulating behaviour. EEG technology allows Christine to track the brain activity of young people on close to a millisecond by millisecond basis. As a result she can pinpoint when a youth is showing difficulties, enabling her to suggest the most effective clinical intervention – which is not always obvious from a youth’s behaviour profile. Starting in 2009 and under the supervision of Dr. Terry Wade, a larger heart health study recruited hundreds of youth between the ages of 12 and 14 years. The Cognitive and Affective Neuroscience Lab recruited a subsample of 100 youth from the larger database. Researchers obtained compliance through letters sent directly to the youth’s home. A parent provided informed consent when the young person arrived at the lab for the 3-hour appointment. Participants wore a non-invasive sensor net of 128 electrodes that had been soaked in a salt water solution. Brain activity was measured while the subjects performed several computer tasks. A researcher sat outside of the testing room monitoring the participant’s responses and could view the youth through a two-way window. The researchers also collected genetic samples using an instrument similar to a soft toothbrush that was rubbed on the inside of each participant’s cheek. Both the parent and the adolescent filled out a number of questionnaires about the adolescent’s ability to regulate their behaviours in everyday settings. how adolescents with different stored genetic information about genes coding for brain chemicals might process conflicting information in the environment differently, and how these two factors together might predict their ability to self-regulate. Christine anticipates that she will need another year to complete her data analysis before she can synthesize the attention results with the genetic results for her dissertation. She is also currently collecting similar data from young adults to see if these associations remain across age groups. Christine’s study makes up a large part of her dissertation and involves up to ten scholars from Brock University Departments of Community Health Science and Psychology, the University of Waterloo Department of Mathematics, and the National Institutes of Health in Bethesda, Maryland. For more information about the study, please contact Christine Lackner at cl02zz [at] brocku [dot] ca or telephone (905) 688-5550 ext 5511.